This week I received the Liebster Award from my friend Sharon of Freely Ronnie! How sweet is that?! 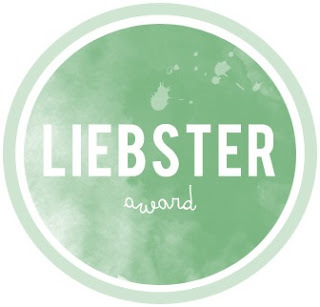 The Liebster Award is for bloggers to recognize and get to know their blogging peers, especially the beginning ones (like me!). 5. The nominated bloggers must be notified of their award!6. No tag backs! 11 Random Facts About Moi! 1. I did archery for fun as a kid and shot many an innocent box in my backyard. 3. Two of my favorite TV shoes are M*A*S*H and Frasier. 4. My dad's side of the family is into car racing, so I've been to a few races and spent some time at the track. 5. I love climbing things. Rocks, buildings, trees, you name it. 6. I was never on any sports team until here in college (where I play intramural powderpuff football). 7. I do a Crossfit-type class at my school gym with some other ladies. 8. I'm getting a degree in International Multicultural Studies (people, pretty much). 9. I can't stand hairballs in showers. Anything else in the world I can deal with, sure, but not those. BLECH. I have no idea why. 10. 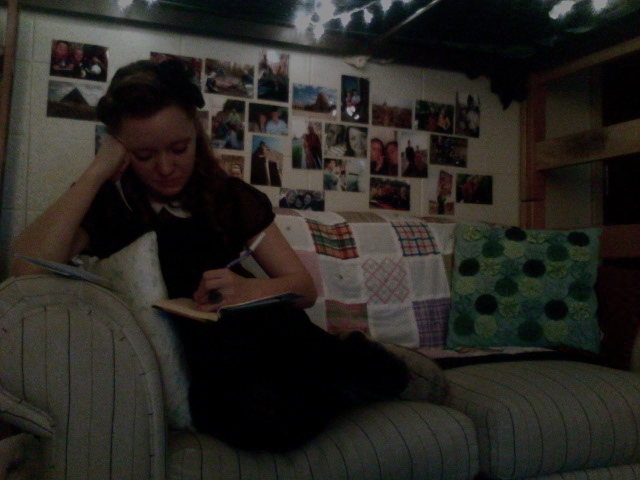 My favorite furniture item to sit on in all the world is a Lovesac. 11. Biscuits and Chocolate Gravy is my favorite family recipe. YUM. 1. Favorite movie? "Gladiator", "Pride and Prejudice", and "What About Bob?" 3. Childhood memory? I would pick random leaves and store them in a pouch. When I got a scrape or something, I would chew up the leaves and put them on the scrape. I was convinced this is how Native Americans used to do it and that it would help! 4. Biggest challenge you face with blogging? Trying to keep good perspective. Blogging success means being in it for the long haul, so I need to remind myself not to compare to bloggers that have been at it much longer than me! 7. Where do you get your inspiration? historical sources and other bloggers! 8. Last tweet or status? "I just heard this coming down the hall, 'ALL HAIL THE BEST ROOMMATE EVER! SHE GOES BY JESSIE KUE! ALL HAIL THE BEST ROOMMATE EVER! SHE GOES BY JESSIE KUE!' Such a great floor. - Amber and Jessie"
9. Snow Day plans? 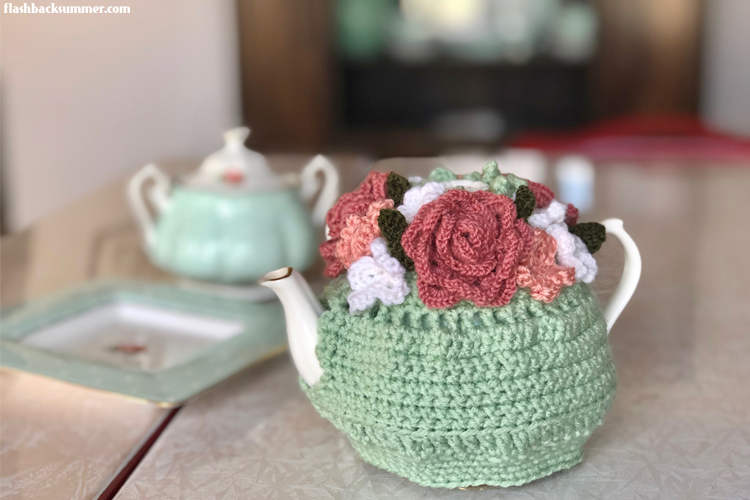 Sit, chill, snuggle, and watch movies while sipping hot chocolate or tea. 10. Biggest fear? Hating my job in the future and being stuck in it. 11. Greatest accomplishment? Coming through culture shock successfully in Egypt and Sudan as a teenager. 1. Most beautiful thing you've ever seen? 2. If you could add one item to your wardrobe (money is no object!) what would it be and why? 3. Top three places you'd love to visit? 4. Favorite kind of cookie? 6. If you could play any instrument masterfully, what would it be and why? 7. Sweet or unsweet tea? 8. Favorite holiday to celebrate? 10. Strangest/most random thing you like? 11. What would your dream kitchen look like? 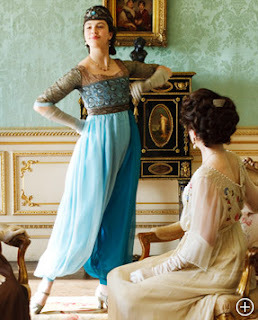 Poiret-Inspired Outfit, and a Tip to Make Your Waist Look Smaller! 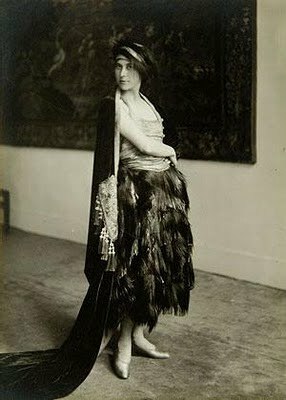 If you've been following my blog the past week, you've noticed that I have done a couple posts on early 1900s Orientalism and the designer Poiret. This whole research journey began with the fact that I don't own any vintage-style trousers, but I did have some Kenyan-Indian "harem pants" in my closet. I remembered seeing some "exotic" outfits of stars in decades past with these types of trousers and Middle Eastern accessories like bangles and headscarves, but I wasn't sure how officially vintage-accurate that was. Thus, I did a bit of research. It is indeed quite accurate! 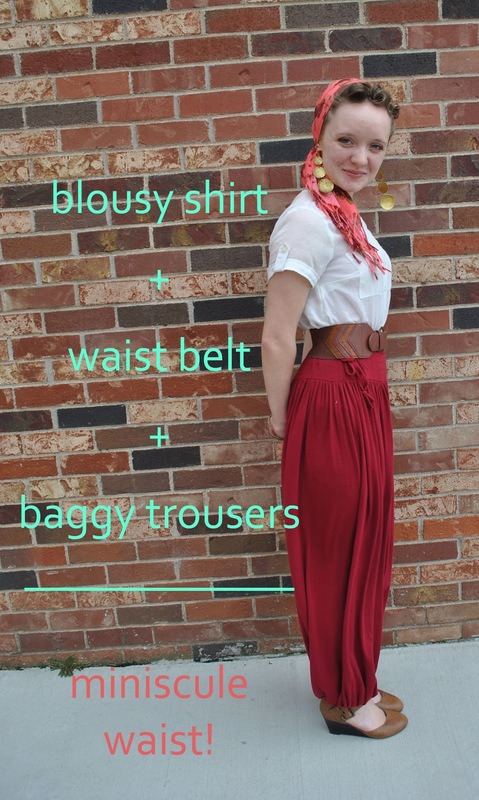 Harem pants aren't a new style at all; they go back to the early 1900s (in the West, that is). Poiret introduced them to the West and scandalized the hemisphere with trousers.... for women! Here's to you, Poiret! I salute your boldness by wearing my own baggy trousers! I was delightfully surprised, for I just added a few new pairs of trousers to my vintage wardrobe options! Woohoo! I created this outfit (though, admittedly, there's some decade mixing with the pin curls thrown in), and I love being able to mix my Middle East love with vintage, as you are probably all aware of at this point! By adding volume to the top and bottom, it creates a smaller-looking waist. Of course, this is by no means an original finding (think lambchop sleeves, hoopskirts, "pigeon breast" shirts, etc.). However, this is the first time I really thought about it with harem pants involved! belt: F21 maybe? Or Francesca's? 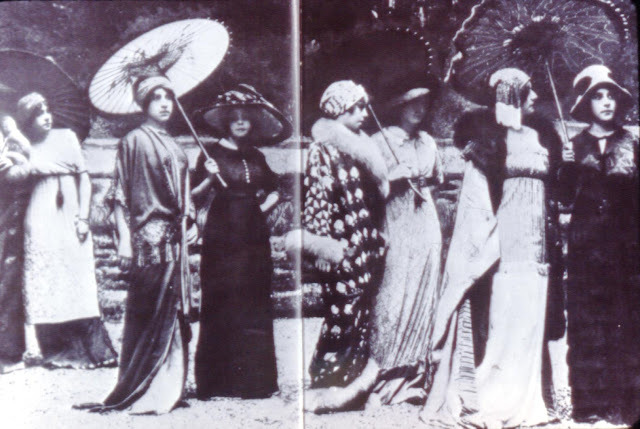 Paul Poiret was a Frenchman who took the fashion world by storm in the early 1900s. Many of his pieces were clearly Oriental-inspired and featured luxurious fabrics, beaded accents, sheer materials,and lush drapery and layering. His designs were often considered scandalous, as well! During the conservative Victorian era, his 1910 collection shocked people with the flowing freeness of the clothing and lack of "proper" underclothing, such as corsets and girdles. His works led the way in what became common 1920s trends. Many of his designs were created for the type of body his wife Denise had. 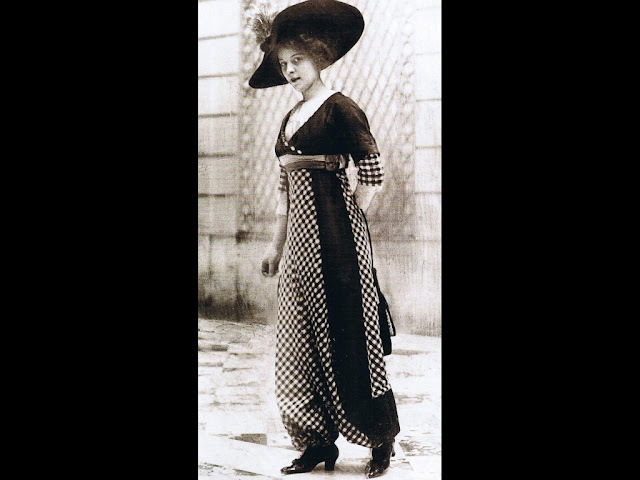 She was, in the early 1900s, considered unfashionably tall and slender, but Poiret said that he saw all the potential in her! 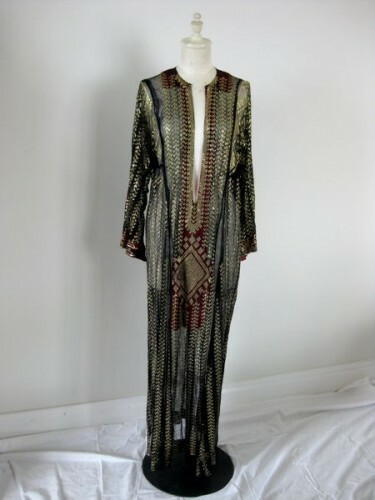 (She was also not much of a fashionista before they met, much to the surprise of Poiret's friends when he married her.) 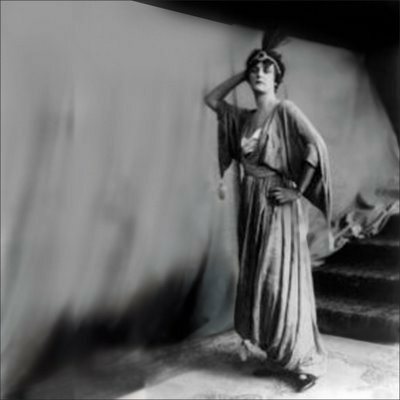 Poiret dressed her beautifully, and he rejected the androgynous, waif-like model trend of the 20s. 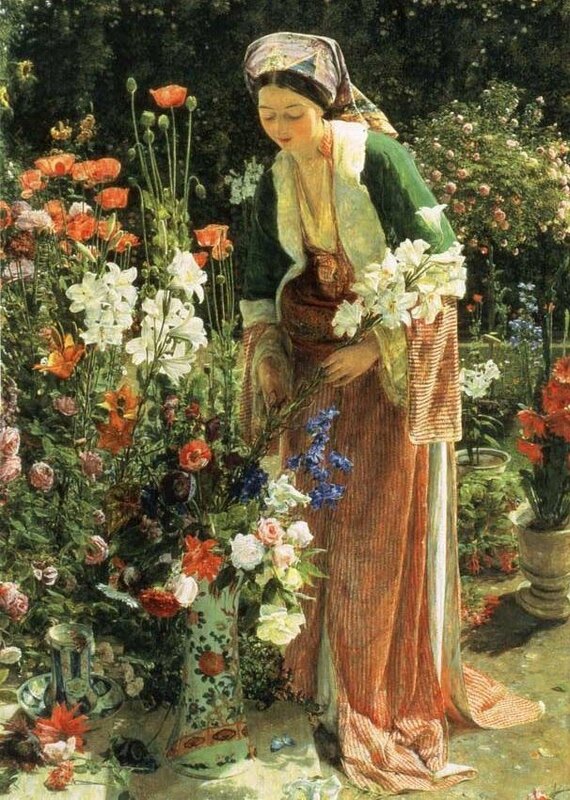 He preferred his wife's figure; she was clearly still a woman, and many of his garments flattered what he considered a gorgeous, womanly, feminine shape. (Which I think is sweet. I wish every man would always find his wife that beautiful.) Though they later divorced, she always held Poiret's work in high esteem. 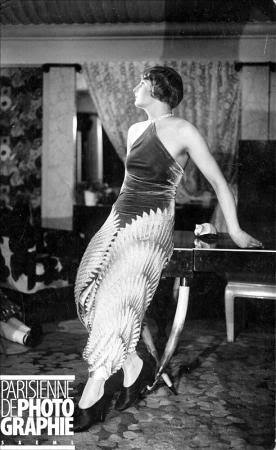 Poiret was an innovative, creative designer and also an entertainer. He held lavish costume parties and designed many costumes for movies as well. 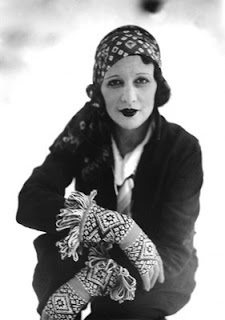 He was also the first designer to recognize the importance of designing for movie actresses both onstage and off and used the press to help his agenda of making fashion a modern art, influenced by artists such as Matisse. Some of his most famous and revolutionary designs included the lampshade skirt and *gasp* trousers for women in the forms of pantaloons and harem pants. However, as time went on, Poiret only stayed ahead of the trends for so long. By the time that skirts were becoming shorter, athletic wear and practical clothing for women was coming about, he refused to change with the times and continued to swath women in yards of fabric which, in comparison to the clean-lined, shorter dresses of the 1920s, seemed bulky and impractical. 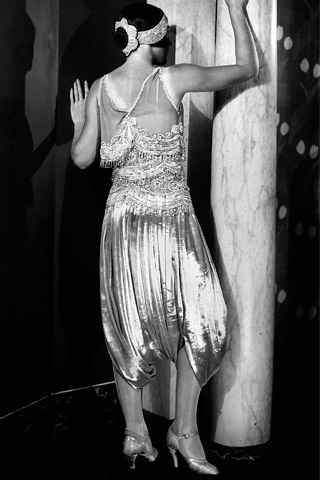 He ended his life in poverty because of the 1929 stock market crash, but his influence on women's clothing is still unmistakeable. Where would we be if he had not had the counter-cultural boldness to create corset-free, comfortable garments for women way back in 1906? What about taking on the idea of designing for actresses on and off screen and helping foster the now inextricable bond between film and fashion? 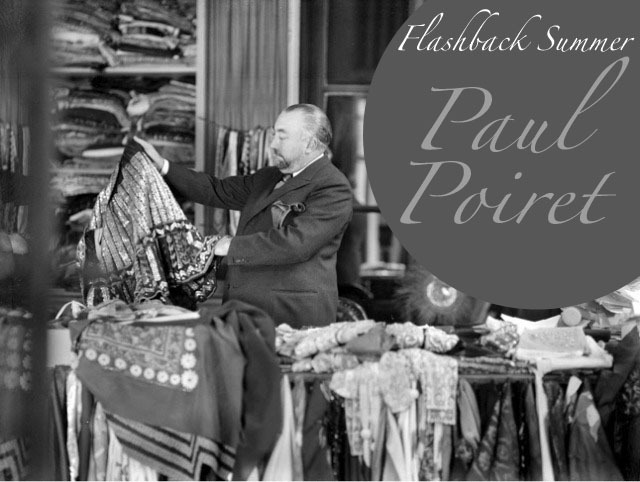 Though much of the world doesn't realize it, we owe a large style debt to Paul Poiret! You may recall this scene from "Downtown Abbey" where the shocking harem pants are debuted! What do you think of Poiret's fashions? Are they too gaudy for you, or do you enjoy the luxury? 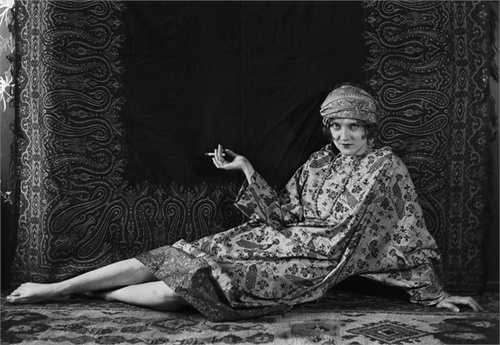 New York Times- "What to Wear to a Revolution"
"Paul Poiret: The Master of Haute Couture"
You've finally arrived in Egypt after a few days of travel. You are riding through old Cairo, surrounded on all sides by thousands of years of history. Tall mosques tower around you on either side, and you hear the muezzins perform the call to prayer with long, haunting notes and exotic minor key melodies. 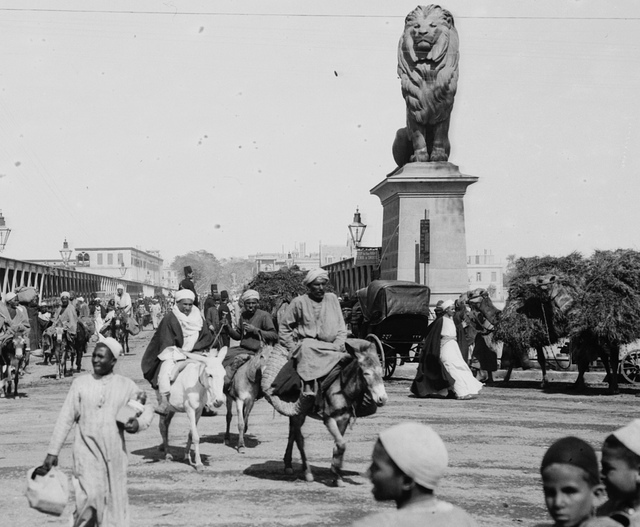 You drive past the proud lions of the Qasr Al-Nil bridge, sharing the road with donkey carts, pedestrians, and loping camels with tall piles of hay on their backs. Next to your window a man in a long white robe and turban carries a long tray of bread on his head, shouting, "Aish! Aish!" to inform everyone of his wares. Women sit in the doorways and watch their children, chatting and laughing. Merchants selling large gold bangles and coined scarves use their most persuasive language to convince potential buyers. The air is filled with the scent of sweet perfumes, humanity, and cinnamon shisha smoke. 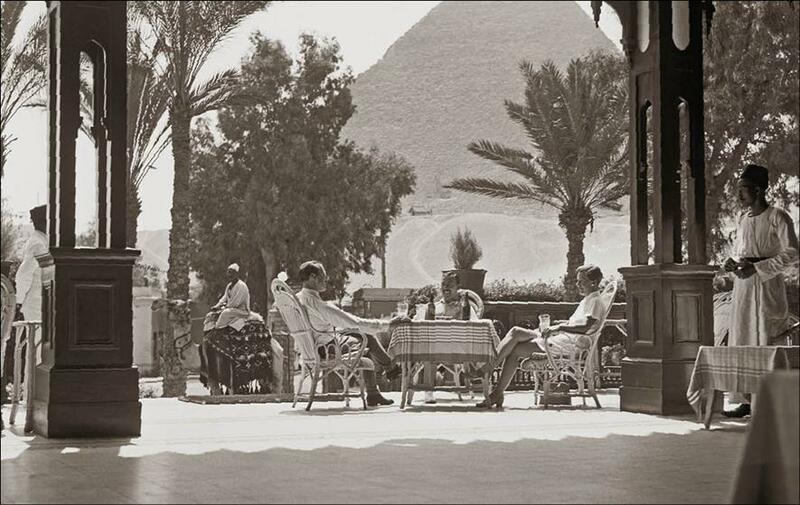 Old men sit in cafes and sip tea as they play backgammon and discuss politics. They pause to stare at you as you drive by. You drive to the outskirts of the city, the buildings being separated by more and more sand. 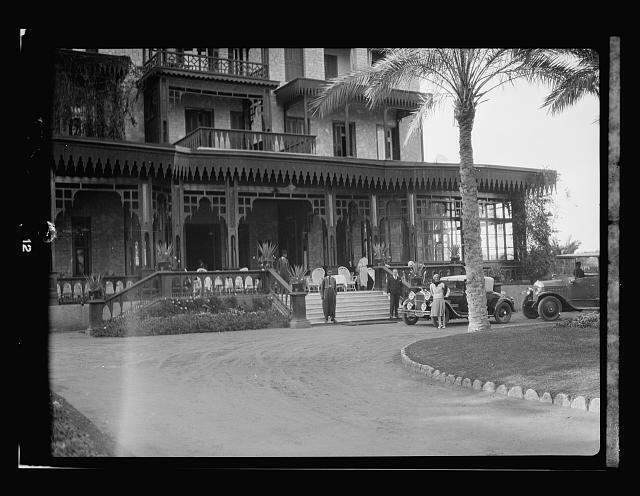 You pull up in front of the Mena House, your lodging for the trip, amazed at the detail and lush setting in such a harsh desert. You step out and the hot desert wind hits your face, the hum of humanity far behind you, and now only quiet rustling of the palm trees. A doorman in long, flowing trousers and a red fez cap opens the boot of the car and takes out your steamer trunk. You follow him through the entrance of the hotel and are taken aback at the luxurious furnishings, exactly what you had only imagined and seen in movies. You check in, and your things are taken to your room. You go back outside to mingle with the other fine looking ladies and gentleman on the veranda. 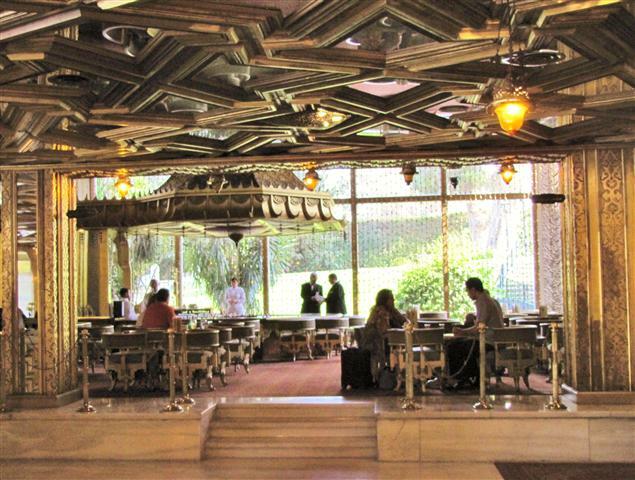 As you walk out, you gasp as you look ahead and see the stunning view of the pyramids at your doorstep. You sit and sip tea, the slight grit of sand and dryness of the desert air softly blowing your curls, and you soak it all in. You can see why Westerners were fascinated with the Middle East in the 1910s and 20s! It was romanticized in art, movies, music, dance, and literature, and the discovery of the treasures of Tutankhamen's tomb in the 20s added to the style craze. 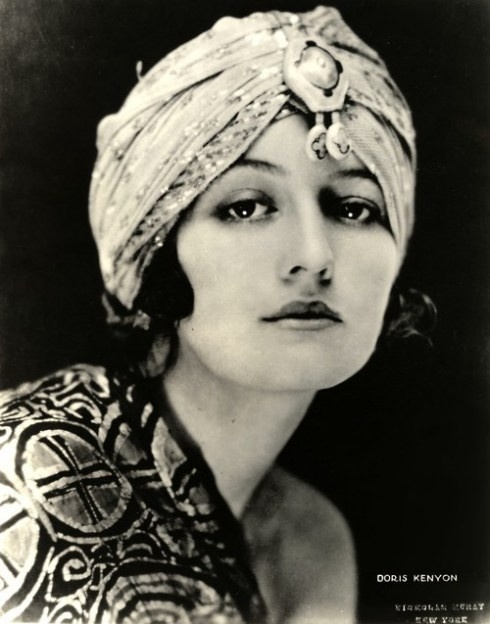 As people read about it in their homes- a place so drastically different from places like Illinois, Quebec, and England- they learned of beautiful women living in harems, flowing robes and jewel-encrusted turbans. The Middle East was a place of mystery, intrigue, and glamour. You can't tell by my face in the picture above, but this morning was a desperate morning. *Easy shirt.... A sweater, 'cuz no layering is needed. *Easy bottoms... High waisted pencil skirt, for an automatically more vintage look. *Comfy shoes, 'cuz I'll be rushing to class.... check. *Accessory to add some texture variety..... cutesy heart necklace, definitely. *Now for hair...... I need something I can stuff most of it into, because I have no time for curling or a bunch of victory rolls... I borrowed a hat from my suitemate, did a little pin curl in the front, and BAM! Ready for class. SUCCESS! necklace: vintage 1980s from my mother! 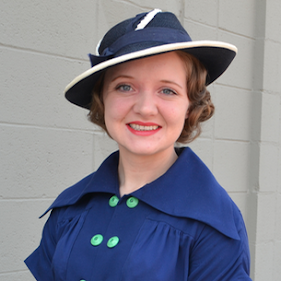 I did wonder if this kind of hat is even slightly vintage, so I did some research. The answer is..... Yes, I think it can work! It's basically a stocking cap, so I don't see why not! It's not perfectly 40s looking, but it works in a pinch. There are so many beautiful clothing items out there. I love me some velvet. It's so luxurious and adds instant glamour. A hat from Behida Holic Millinery. 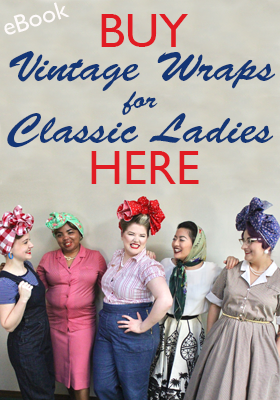 This Etsy shop is breathtakingly beautiful (and so is the woman in all the photos!). I would take pretty much anything from this store. Vintage lace-up or combat boots. A tailored 1940s suit with unique details. 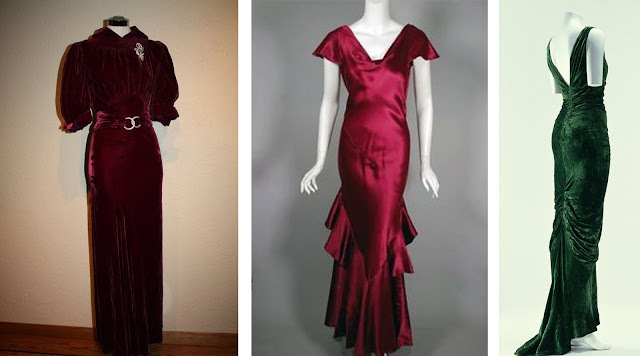 Preferably a 1920s one or an opera coat. I just love those silhouettes! 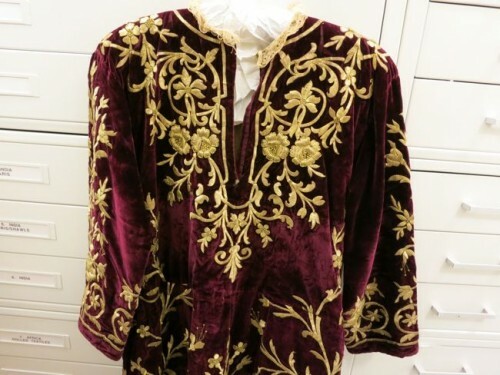 Do you have a "castle in the air" list of clothing items you'd love to have? What is on it? Have you ever gotten an item you've dreamed of? This post is goin' deep and real today. I don't know about you, but my life has been busy lately. Like this whole school year. With the addition of my new position as an RA and involvement in other things, I oftentimes feel like I'm going all the time without much recuperation. Our modern society likes to make us think that's normal, doesn't it? It didn't used to be that way. I can't necessarily speak for other countries and cultures, but I know that in America down time isn't always a respected thing these days. It's better to be busy, to be productive, to look involved, to seem as if you can effortlessly juggle fifty things with Wonder Woman-like effectiveness. But how long do we think that will last? We aren't made to run forever. Knowing that, I'm taking extra steps to slow my life down when I can, to put priorities on the important things in my life and to let myself rejuvenate so I can continue to pour out what I have to others. For me, this means that I'm putting extra emphasis on spending time with God daily, reading the Bible and talking to God about it, just feeling the peace that comes from being around him. This kind of spiritual rest brings me more rejuvenation than any other thing in the world, bar none! 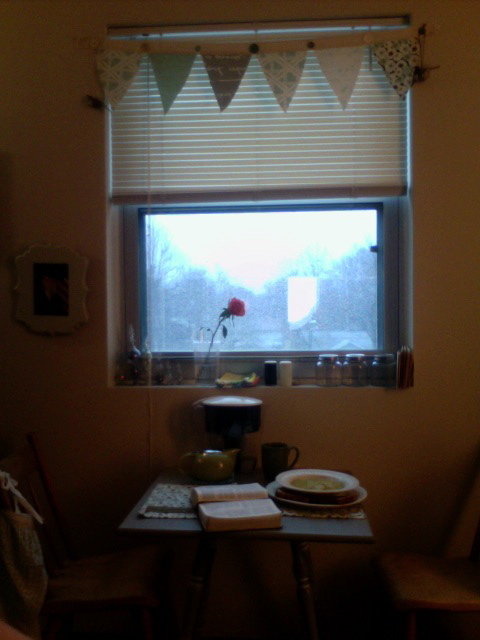 Today, specifically, I also took time to journal, wear my fuzzy slippers, eat some delicious soup, and sit at my table, look out my window, and listen to the rain. 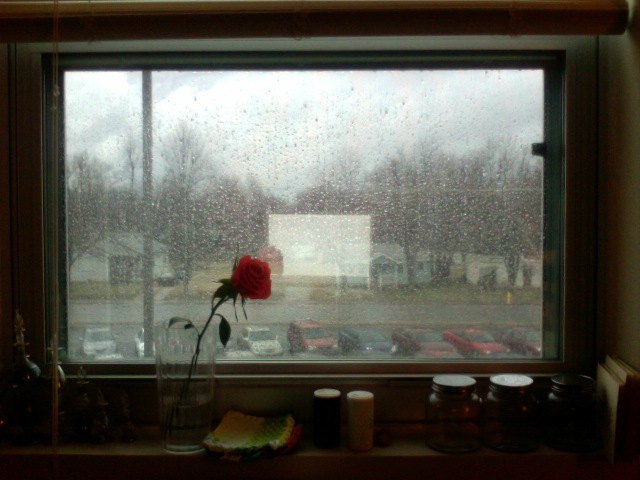 Just to sit and enjoy the stillness (rare in a dorm). My crafting endeavors have also been more frequent, because they're one of those life-giving things for me. What do you think of the way that modern society pushes busyness? How do you feel about your current life pace? What sorts of things are "life-giving" for you and help you relax and rejuvenate? What things do you want to put more priority and focus on this year? Spring Break Travel Week Series!